View to the northeast of a fuming ground fissure atop Smoky Mountain. Photo: David Rankin (used with permission). Smoky Mountain GeoSight location map. The cracks and fissures atop Smoky Mountain are located approximately 245 miles south of Salt Lake City. From Kanab, drive east on U.S. Highway 89 for approximately 57 miles to Big Water. Turn left (north) onto Ethan Allen Road for 0.3 miles and turn right (east) onto National Park Service (NPS) Road 230. Continue for 12.7 miles and make a slight right to stay on NPS 230. After this junction, NPS 230 is also known as Smoky Mountain Road. Continue for 1 mile and stay left to stay on Smoky Mountain Road (also known as Bureau of Land Management [BLM] Road 300). Stay on Smoky Mountain Road for the next 7.6 miles as it winds up 1,000 feet of elevation to the top of Smoky Mountain. As the road levels out at the top of the climb, continue past the viewpoint pullout for an additional 1.4 miles to an unmarked road on the right. Turn at this unmarked road and continue for 0.6 miles to another junction on the right. Turn at this junction and continue for 0.2 miles to where you will park. Upon exploring the vicinity, you will see the numerous ground fissures. Remember though—if it is smoke you are looking for, then you will need to visit on a very cold day. Note: NPS 230 and Smoky Mountain Road (BLM 330) are generally impassible during and shortly after wet weather conditions and cross numerous washes that can be subject to flash floods. Please research weather and road conditions before planning a trip. A helpful website that provides road conditions for Grand Staircase-Escalante National Monument is http://ow.ly/SCYRH. Also, be advised that web-based mapping services as well as paper maps/atlases from various sources tend to disagree as to what names are given to the roads to Smoky Mountain, so please research your route thoroughly before starting your journey. Nobody denies southern Utah can be blazing hot. An area north of western Lake Powell is even dotted with heat-related place names: Warm Creek, Burning Hills, Smoky Hollow, and Blackburn Canyon to name a few. These place names actually signify underlying heat sources that have nothing to do with the air temperature. One place has actually been burning hot for hundreds and maybe even thousands of years. Atop the appropriately named Smoky Mountain, you will find… no flames whatsoever. A bit anticlimactic yes, but there truly is a fire (known as the Big Smokey Fire), although it is burning (or at least smoldering) underground. Large fissures or cracks in the ground feed oxygen to this underground fire. Expectations may be high to see the gaseous fumes from this fire venting from the cracks, but realize this is only possible when temperatures are near or below freezing. The extra time required to bundle up for cold temperatures shouldn’t dissuade your visit though, as you will be rewarded with a scene similar to a volcanic area such as Yellowstone National Park. However, an underground coal seam (or seams), rather than a volcanic hotspot, fuels the fire beneath Smoky Mountain. Smoky Mountain’s numerous coal seams are interbedded among 1,000 feet of Cretaceous-aged mudstone and sandstone known as the Straight Cliffs Formation. The Straight Cliffs Formation was deposited approximately 80 to 90 million years ago when the area was encroached upon by a fluctuating body of water called the Western Interior Seaway. The fluctuating sea level caused deposition of the alternating layers of mudstone, sandstone, and coal you find in the cliffs and ledges of Smoky Mountain. A thick layer of sandstone dominates the uppermost cliffs of Smoky Mountain and overlies a poor foundation of soft mudstone. In the area of the Big Smokey Fire, numerous long fissures, or ground cracks, run parallel to the cliff edge. The cracks near the cliff are likely due to the erosional undermining of the cliff’s mudstone base. Other cracks developed as the underlying coal seams burned out and reduced to ash, leaving little to no support for the overlying sandstone. These cracks eventually propagate to the surface, allowing additional oxygen to reach the fire, so it is unlikely that a lack of oxygen will naturally lead to the fire’s demise. You may be wondering, “How did this fire start in the first place?” Spontaneous combustion or a lightning-sparked wildfire are the two probable candidates. Coal is susceptible to spontaneous combustion due to its ability to self-heat in the presence of oxygen and moisture coupled with minimal ventilation for cooling. In the case of a lightning-sparked wildfire, hot embers may fall into preexisting fissures, igniting any exposed coal. Once coal begins burning, it often burns until there is none left, or the oxygen source is cut off. On two separate attempts (1967 and 1968), the U.S. Bureau of Mines tried to extinguish the Big Smokey Fire with water and other fire retardants to no avail. Additionally, bulldozers and excavators filled the cracks with rocks and dirt hoping to smother it; however, the unyielding coal fire continues to smolder to this day. A visit to the site today reveals these human disturbances as many of the fissures are mounded over with boulders and crushed rock. As proof that the fire still burns, new cracks have since propagated to the surface since the ’67-‘68 extinguishing attempts. 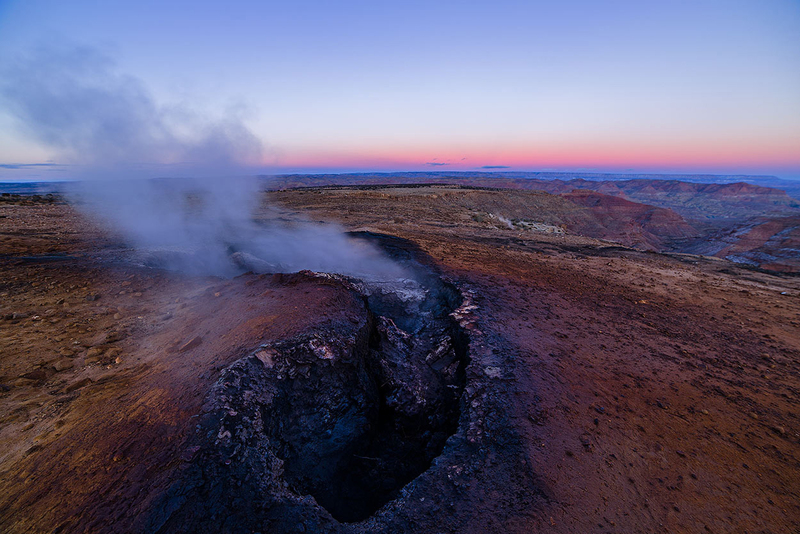 Because this coal fire is a naturally occurring phenomenon, it will likely continue to smolder until the coal is gone as this location is now part of Grand Staircase-Escalante National Monument, which preserves the land within its boundaries for non-destructive scientific studies. Underground fires may seem like an anomaly local to Smoky Mountain, but there are actually thousands of these blazes burning uncontrolled throughout the world. China is home to a majority of coal seam fires with an estimated 20 to 200 million tons of coal burned each year. Utah has had eleven uncontrolled coal seam fires concentrated in Kane, Emery, and Carbon Counties. Between 1958 and 1976, the U.S. Bureau of Mines attempted to smother eight of Utah’s active coal seam fires at an inflation-adjusted cost of over $4.1 million. The Zion Fire, located between Mt. Carmel Junction and the eastern entrance to Zion National Park, was successfully extinguished, but the remaining seven actively burn today. Coal is not the only fuel for underground fires; natural gas fires also burn in a few places across the planet. For example, the “Door to Hell” in central Turkmenistan is a blaze that began as an exploratory oil well in 1971. Drilling operations encountered natural gas, which subsequently destabilized the land and caused the drill rig and camp to be swallowed up by a 66-foot-deep crater approximately the size of two basketball courts. Estimating the noxious fumes would burn off in a couple weeks, the escaping natural gas was ignited. As it goes with many estimates, it was wrong, and the fire still burns 44 years later.